What multi-pass channels are available? 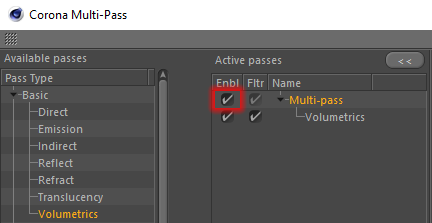 Note: Don't forget to check the Enable box to use multi-pass rendering! Note: Where relevant, these passes can have Denoising enabled independently for each pass. All diffusely bounced direct illumination (light that bounced exactly once in the scene before hitting the camera). All light that is emitted directly into the camera, with no bounces (e.g. directly visible lights sources, scene environment). All diffusely bounced indirect illumination (light that bounced at least twice in the scene before hitting the camera). All light specularly reflected into the camera (both direct and indirect). Includes imperfect and perfectly glossy (mirror) reflections. All light that has passed through a surface with refraction (both direct and indirect). Includes imperfect ("frosted glass") and perfectly glossy refractions. All translucency lighting (both direct and indirect). It contains the scattering in volumetric media (useful for example for separating clouds and fog). Outputs the angle between the surface normal and ray direction (similar to the Falloff map). White indicates surface directly facing the view; surfaces facing away from the view (grazing angles) are black. This quickly shows how the scene looks without shading. Outputs the surface normal vectors as color values (with transformation RGB = (XYZ+[1,1,1])/2). Uses normals directly calculated from the geometry, with no bump mapping or smoothing groups. Outputs the surface normal vectors as color values (with transformation RGB = (XYZ+[1,1,1])/2). Uses the final shading normals from the lighting calculation, which include the effects of bump mapping and smoothing groups. Outputs the surface mapping coordinates for selected channel. This can be used to check for mapping discontinuities and objects lacking mapping. Outputs a 32 bit image containing velocity information, which can be used to add motion blur in post-processing. It offers a choice between World and Camera mode, with adjustments for multiplier and offset - the mode and values you use will depend upon the expectations of your post-processing application, for example Black Magic Fusion expects the defaults of Camera mode, Multiplier of 1, and Offset of 0. Outputs the surface world position XYZ vector directly as RGB color. Outputs the z-buffer channel, with adjustable min (white) and max (black) depths. Assigns a random color to each pixel using one of the available modes. The most important ones are: Primitive ID: each primitive (typically triangle) in a mesh has different color, Material ID: each assigned material ID has different color, and Instance ID: each scene object has different color. Creates a custom set of rules for including/excluding each object from the mask. The available conditions are material gbuffer ID, object gbuffer ID, and direct object selections. Renders each object with a solid color based on the color used to display the wireframe in the CInema 4D viewport (this is set using the Basic tab in the Attributes Manager for each object). Shows the albedo (total reflectivity of the surface - the fraction of energy that is reflected in any way from the surface) of the scene surfaces. Scenes with too high albedo can cause problems - washed-out look and excessive render times. This pass can be used to quickly spot and fix problems - typically if your walls/floors/ceilings are shown in red, lowering their brightness will speed up rendering. Note: red does not automatically mean bad. Only problem is red on large, diffuse areas, like walls. For more detailed guide, see: What is albedo? This pass will still render if "Render only masks" is checked. Duplicates the built-in alpha channel, so it can be saved to a separate location. Shows bloom and glare effects against a black background. See: how to use bloom and glare? Shows the beauty pass with independent bloom, glare, and denoising settings. Can be used to store both versions of the beauty pass - with/without denoising, with/without bloom and glare, without the need to re-save a separate file. This shows one component (diffuse, reflect, refract, …) color divided by the corresponding CShading_SourceColor (input texture) value. This results in a “raw” lighting, not containing the surface color/texture. Shows the shadows (energy subtracted from the image due to shadow ray occlusion). This is the complement to the beauty pass, showing white where there are black shadows. If this pass is linearly added to the beauty pass, it negates the visible shadows. Note that currently the shadows from environment lighting are always shown, resulting in a washed-out pass in typical interior renders. The input color of a selected component (diffuse, reflect, refract, …). This is the value read from the texture, clamped to obey energy conservation laws. 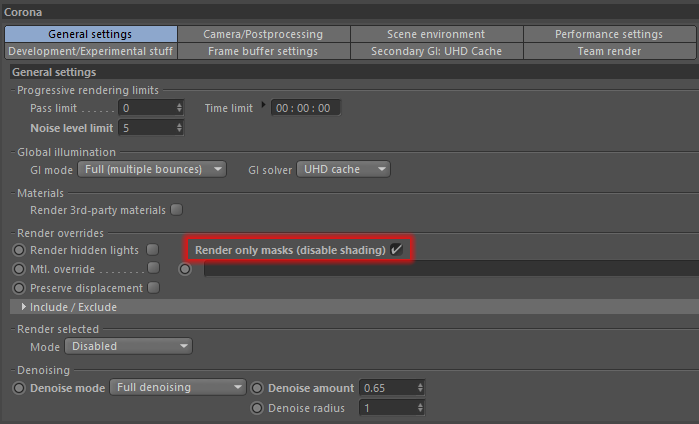 This pass will still render if "Render only masks" is checked. Full details on how to use LightMix can be found at How to use Interactive LightMix in Corona for C4D? This is the main LightMix element. It has to be added for LightMix to work. Bloom and glare can be toggled for this channel. One LightSelect channel is required for each light that is to be controlled by the interactive LightMix. One or more lights can be included in one LightSelect channel. Allows evaluation of an arbitrary texmap on all scene surfaces/environment. For example the AO pass can be easily created by adding CoronaAO texmap into this pass map slot. See: how to use ambient occlusion? Allows grouping channels into folders.